New Delhi: In the backdrop of rising number of cases of malaria, chikungunya and dengue, the Delhi government has decided to launch a major campaign to raise awareness among people about methods of prevention. Delhi health minister Satyendar Jain on Tuesday, however, said the proportion of cases being reported in Delhi are “far less” as compared to some of the other states, like Gujarat and Maharashtra. At least 30 fresh cases of dengue were reported last week, taking the number of people affected by the vector-borne disease in the city this year to 180, according to the latest municipal report. The total number of malaria cases recorded till 22 July has shot up to 230 while the chikungunya cases stand at 195, it said. “In a week’s time we are going to start a big campaign to raise awareness about prevention of vector-borne diseases. We are already working in collaboration with MCD to put up hoardings on the theme, and we will also involve the masses in our campaign,” he told reporters. Jain, quoting figures of the National Vector-Borne Disease Control Programme (NVBDCP) said, till 16 July, at least 23,094 cases and 32 deaths due to dengue have been reported across the country, while Delhi has only 180 cases. Also, two deaths due to swine flu have been reported in Delhi, but fatalities due to this disease recorded in Gujarat and Maharashtra are quite high, he said. “We are prepared and have adequate stock of medicines and we will make more arrangements as per the situation,” he said. Authorities in Delhi fear the cases in the city may rise as the season for the vector-borne diseases begins from mid-July and generally lasts till November-end. 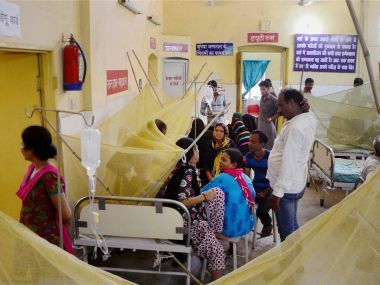 Cases of all three vector-borne diseases have been reported much earlier this time, which doctors have attributed to early arrival of the monsoon. Of the 230 malaria cases, 116 affected people were residents of Delhi while rest of the cases diagnosed were traced to other states. At least 57 cases have been recorded this month. Of the 195 chikungunya cases, 127 of the affected people were residents of Delhi while the rest were from other states. Next Next post: Where in the world is former The Bachelor Blake Garvey?